How can I stop ruminating / thinking in a loop? Learn how you can let go of negative thoughts and move on with life without getting caught up ruminating. Rumination is a negative downward spiral way of thinking and while it seems to make sense to think things through over and over again to find THE solution, there are problems that you simply can not solve on the same level. Being able to accept this and finding ways to break the loop of thinking is essential to live a more relaxed and stress free life and find the objective distance to come up with a real solution. You think about the problem one more time and get started with your plan to solve it. Download the PDF with all 11 steps to stop ruminating. Acceptance is the key to start finding solutions and breaking the loop. The first step is to realize and understand that rumination isn’t helpful. Comparing your current state to your desired state will also simply make you feel worse, as well as going through all “if… then” scenarios you can imagine. Accepting the situation, being in the present moment and allowing negative thoughts to fade away while working on an action plan what you can do is the key to overcome rumination. You can let go of the pressure that you have put on yourself after thinking about the problem one more time and coming up with a plan how to solve it (or simply accept it and be with it). The role of rumination in depressive disorders and mixed anxiety/depressive symptoms. Nolen-Hoeksema, Susan, Journal of Abnormal Psychology, Vol 109(3), Aug 2000, 504-511. Effects of self-focused rumination on negative thinking and interpersonal problem solving. Lyubomirsky, Sonja; Nolen-Hoeksema, Susan, Journal of Personality and Social Psychology, Vol 69(1), Jul 1995, 176-190. Overgeneralization is when you try to categorize every single event as part of a never-ending process. For instance, when you fail to pass a job interview you say, ‘I always fail to impress.’ Similarly, when you fail to win in chess you say, ‘I can never win in chess.’ Words like ‘never’ and ‘always’ are part of the overgeneralization process. Every time you categorize a person, event or thing with a neve- ending pattern, it becomes a part of the overgeneralization process. If you think your friend is ‘always’ mean with you it is overgeneralization. It is very common for people to overlook positive experiences in favor negative ones. Some people think their positive experiences don’t count, while others don’t even realize their positivity. For instance, if you are able to work 8 hours in a day and your friend works for 9 hours, you will always look at that one hour that your friend works and you don’t. Another good example is that when a currency trader wins $1000 in a day but loses $200, he is depressed about the loss but not happy about the winnings. Definite statements are also known as ‘should statements.’ These are statements that raise great expectations. For instance, you believe your friend ‘should’ bring you ice cream tonight because you have told him to do so. If he doesn’t, this thinking will lead to anger, frustration and depression. Very often you will find yourself or others blaming ‘the other factors’ in their lives for their problems. For instance, if your friend didn’t succeed in a job interview he might say ‘I would have passed it if my parents had wished me luck.’ Such statements and thinking are part of the personalization or blaming process. Why blame others for what you couldn’t achieve? This is an extreme way of black-and-white thinking. Here, the person tends to categorize people under either the good label or the bad label. If your friend didn’t give you his car for a day you would think he is not a good friend instead of realizing that he must be busy or something. Emotional reasoning is taking feelings as facts and basing your decisions and actions upon them. For example, you feel guilty about having spent so much money on some sports equipment for yourself and then you criticize your partner for having spent a bit more money on some new clothes. Another example would be putting off something important just because you don’t “feel” like it. Exaggeration is, for example, when you exaggerate the good qualities of a person to such an extent that you overlook their negative points. If your friend helps you out financially you might consider him as a person you can trust even though you have never tried him out. In this case, you predict the negativity of a situation or a person without even experiencing it. For instance, you assume that the job interview you are going for will not work out well, and you bring that mindset to the interview. You might think you know another person so well that you can predict his reaction or attitude towards a certain issue. For instance, if your friend is annoying you, you think it is because he never liked you. You then continue to react with the same mindset instead of understanding why he is actually doing so. If you are mentally filtering you focus, for example, on a negative detail of an event or person and overlook anything positive that may be there. For instance, your neighbor is actually a good person with just one bad habit: he plays loud music which disturbs you. Instead of talking it out with him, you think it’s of no use because he’s simply evil, even though he might not be aware that the music is too loud. It’s absolutely normal for us humans to run into some of these ways of faulty thinking while observing our thoughts. Instead of reacting to what you believe or think is right about a person or a situation, believe instead in the actual evidence. Examine how others are behaving to such situations or people and why. What are they doing to counter this? Maybe what you assume is not correct. Even if it is right, you don’t have to believe in it until you prove its validity. You can put someone down in a harsh way just because you never liked him. He did something you didn’t like and now you are harsh and mean towards him. But if the same attributes were shown by someone you loved, you would shrug it off as not a big deal. Try to avoid such double standards. Avoid Black and White…Go for Gray! Nothing is ever either completely perfect or imperfect. Instead of categorizing things as ‘perfect’ or ‘imperfect,’ try rating them on a scale from 1-10. Even if you didn’t pass the job interview, you still were shortlisted, weren’t you? This means that your resume or your qualifications were good enough to catch their attention. Therefore, this situation should be rated as an 8-point situation instead of a failure. People often use vague and imprecise words to describe their feelings. For instance, if your partner lied to you, don’t just be ‘angry’ and say to yourself that you are angry. Be more specific and choose the words that best describe your current feelings. Maybe you are disappointed and feel let down and are also angry with yourself for trusting him and now feel as if you were stupid to do so? Try using specific terms to understand your thoughts and feelings. This will teach you to analyze things as they are instead of broadening them. Instead of blaming another person entirely for something that has happened, think about the circumstances that may have contributed to the outcome. If a friend has betrayed you, instead of simply saying he’s a jerk and that’s why he did it, consider why he did what he did and believe in the evidence. Maybe he didn’t like the way you behaved with him? Maybe he didn’t know that you would consider it a betrayal? There could be a plethora of reasons that you have overlooked. How can I stop thinking about something over and over? Learn how you can use elements of the cognitive behavioral therapy and the ABC model along with meditation to overcome problems and stop worrying. You are not your thoughts and there is a way to stop thinking about something negative over and over. This lesson connects what you have learned in the previous lessons and shows you how you can use this to live a calmer and more stress free life in which the real you and not your thoughts and emotions are in control. Use what you have learned to get more control over your inner processes. First you ask yourself if your thoughts and emotions are helpful and if not you look at the problem one more time. You use the ABC model (or ABCDEF worksheet) to identify faulty thinking and come up with a plan you stick to. Whenever you fall back into thinking about the problem again you use mindfulness meditation and labeling to let it fade away and cultivate acceptance. How can I practice to enter the state of being more often? In the previous lesson you got to know the state of being. In this lesson you will learn how you can use mindfulness meditation to enter the state of being and stop being involved in your inner processes and just observe what’s going on. This ability of taking a step back and just becoming an observer of your thoughts and emotions is very powerful and can truly change your life. Meditation is an exercise like other mental exercises such as concentration or memory exercises so you do not have to worry about getting into anything esoteric or religious. Practicing meditation helps you to enter the state of being and observe your inner processes. To practice meditation you select one object of meditation you focus on, for example your breath, and then observe this object in a non judgmental way. By practicing this you learn to direct your awareness and raise your base level of concentration and this helps you to become more aware of your inner processes. Britta K. Hölzel, James Carmody, Mark Vangela, Christina Congletona, Sita M. Yerramsettia, Tim Gard, and Sara W. Lazar. Mindfulness practice leads to increases in regional brain gray matter density.Psychiatry Res, 2010. Lazar SW, Kerr C, Wasserman RH, Gray JR, Greve D, Treadway MT, McGarvey M, Quinn BT, Dusek JA, Benson H, Rauch SL, Moore CI, Fischl B. Meditation experience is associated with increased cortical thickness. NeuroReport, 2005; 16: 1893-1897. Davidson, Richard J.; Kabat-Zinn J, Schumacher J, Rosenkranz M, Muller D, Santorelli SF, Urbanowski F, Harrington A, Bonus K, Sheridan JF. (2003 Jul-Aug). “Alterations in brain and immune function produced by mindfulness meditation”. Psychosomatic Medicine 65 (4): 564–570. doi:10.1097/01.PSY.0000077505.67574.E3. What are our modes of operation and how can awareness help us to spot automatic thoughts? Get to know the state of being (broad awareness) and the state of doing (typical “work mode” concentration). Learn why the state of being matters so much and most of us are much more trained to remain in the state of doing. Both states have their advantages and in the upcoming practical lessons in this chapter you will learn how to train your state of being and become more aware of what’s going on in and around you. Sate of being = state of broad awareness that helps you to become more aware of what’s going on inside and around you. The state of being helps you to see your thoughts just as they are. Instead of identifying with your thoughts you take a step back and observe your thoughts passing by. By doing this you experience the impermanent nature of thoughts and are able to spot common thinking patterns that might lead to negative emotions or reactions. This is a great way to uncover automatic thoughts and identifying them is the first step to change them. Brown, Kirk Warren; Ryan, Richard M. (2003). The benefits of being present: Mindfulness and its role in psychological well-being. Journal of Personality and Social Psychology, Vol 84(4), Apr 2003, 822-848. Zindel V Segal; John D Teasdale; J Mark G Williams (2002). Mindfulness-based cognitive therapy for depression : a new approach to preventing relapse. New York [u.a.] : Guilford Press, c 2002. How can I use the ABC model in everyday life? The main thing you should take away from the previous lesson (Chapter 1: Control, Happiness and a Simple Model) is that if you can control your thoughts and automatic thoughts you can control how you feel and how you act and that gives you way more control over your life and makes you happier. Now lets have a look how this can help you in everyday life. I will ask you to write some things down. Some of you might not like this but writing things down really makes a difference. It helps you to organize your thoughts and because we work a lot with thoughts in this exercise you will want them to be organized. Understanding what’s going on inside of you is the first step for changing it. 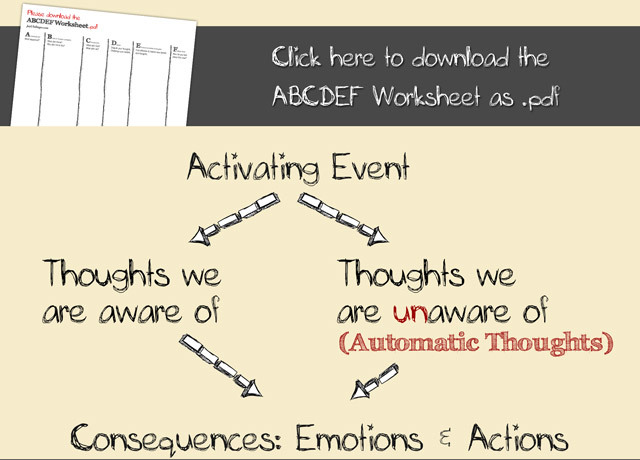 Using the ABCDEF worksheet helps you to stop reacting automatically to activating events just because you are so used to react to them in a certain way. It helps you to open your mind to different thoughts and therefore different ways of reacting and shows you what’s going on inside of you and why you think how you think.